Laboratoire Matière et Systèmes Complexes - 18 juin 2018. Séminaire MSC. Tomohisa Norisuye (Kyoto Institute of Technology) : "Structures and Dynamics of Microparticles in Suspension Probed by Ultrasound Scattering Techniques"
Accueil du site > Séminaires > Archives séminaires > Séminaires 2018 > 18 juin 2018. Séminaire MSC. Tomohisa Norisuye (Kyoto Institute of Technology) : "Structures and Dynamics of Microparticles in Suspension Probed by Ultrasound Scattering Techniques". Ultrasonic waves are widely employed in medical diagnosis and non-destructive testing to observe the condition of fetuses and to study non-transparent materials, respectively. Although ultrasonic waves are mostly applied to relatively large-scale structures, megahertz ultrasound has been utilized to investigate the microstructure of particulate matter and the local dynamics of soft matter. More recently, due to the development of high-speed recording technology with large memory storage and sophisticated techniques employing scattered amplitude and phase, analyses of the dynamics as well as the structures of highly turbid suspensions are possible for a wide range of concentrations and particle sizes (several tens of nanometers to several tens of micrometers) using new routes . The technology could simultaneously allow the investigation of complex dynamics involving the Brownian motion of nanoparticles  and sedimentation  due to the formation of large aggregates. The advantages of using ultrasound are not only the applicability to optically turbid systems but also the wave characteristics related to mechanical (viscoelastic) information , allowing one to evaluate the elastic moduli of particular components, e.g. the elastic shell of a microcapsule immersed in liquid without dilution or drying of the sample . 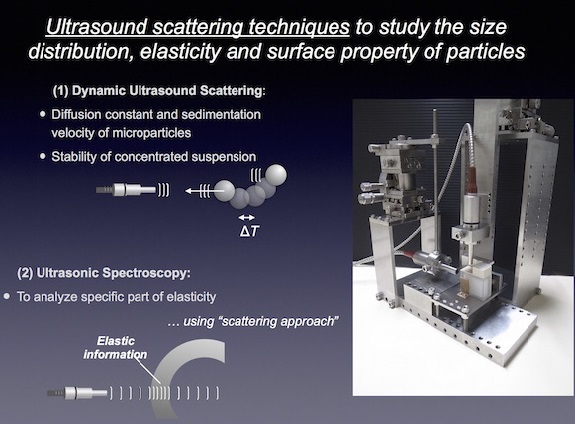 In this talk, the recent developments of novel ultrasound techniques for soft matter characterization will be shown.